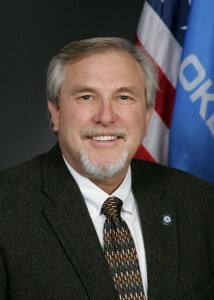 David Perryman is currently serving in the Oklahoma House of Representatives, representing District 56 (including parts of Grady, Caddo and Kiowa Counties). David has deep roots in Oklahoma and District 56. His great-grandparents settled in western Caddo County in 1902 as they saw Oklahoma as a place of opportunity for themselves and for their children. David graduated from Kinta High School then earned degrees from Eastern Oklahoma State College, Oklahoma State University, and the University of Oklahoma College of Law where he received his Juris Doctorate. He has been a partner in a local law firm since 1987 and has represented corporations, small businesses, medical facilities, rural water districts, cities, towns, public trusts authorities and non-profit entities for more than 34 years. David is a partner in the Chickasha law firm Frailey, Chaffin, Cordell, Perryman, & Sterkel, LLP. He is also a member of the Chambers of Commerce of Noble, Tuttle, Blanchard, Anadarko, Chickasha, and Minco. David has served in the legislature since 2012 and currently is a member of the Agriculture & Rural Development Committee, the County & Municipal Government Committee, the Banking, Financial Services and Pensions Committee, and the Judiciary Committee. For information about David's work in the State House, or on various committees, please see the links above.